At the time of this writing, it is early April of 2009, and I am still floored from my experience from the August 2008 944Fest – but I’m even MORE excited for the upcoming ‘Fest June 5th-7th, and you should be too! Never heard of the 944Fest? I’ll elaborate on it a bit. For the past few years, the 944Fest has been a great congregation of water-cooled, front-engine Porsches and their owners, which means the name ‘944Fest’ isn’t completely accurate. While the event is dominated by various iterations of the 944, 924s, 928s and 968s in any of their iterations are also welcome to join in on the fun. 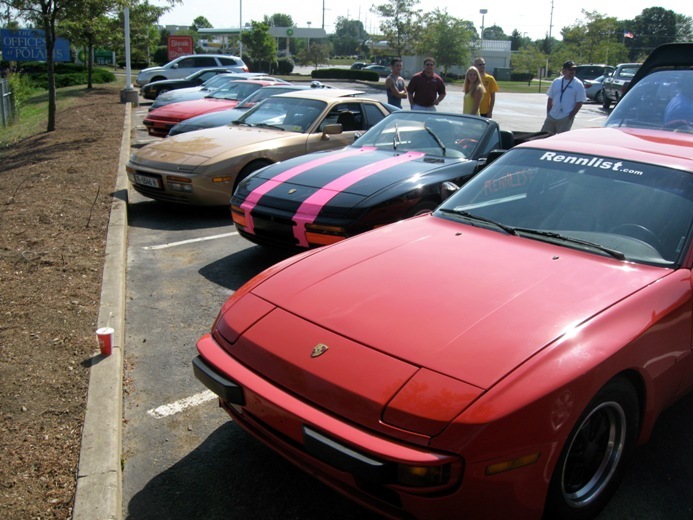 A shot of some of the vehicles I caravanned up to last year’s 944Fest with. Yes, that is a black turbo cab with pink race stripes. Yes, he’s a bit…. Different. This year, the ‘Fest is being held at Nelson Ledges Road Course, in Garrettsville, Ohio, which sort of makes the whole event a Midwest Mecca for 944 owners. You see, Nelson Ledges was where Porsche first introduced the 944Turbo stateside. You can almost call it a religious experience as you relive the first corners taken on US soil! A High Performance Driver's Education (HPDE) event starts Friday morning, and those who sign up get five 30-minute sessions on the track! There are many drivers like me that actually show up Thursday night; it saves you from a long morning drive before a grueling track day and it also allows you to pick out some of the better locations to set up camp. First time to Nelson Ledges? First time on ANY road course? Not to worry, you'll be paired up with an instructor so you can learn the ropes without fear of damaging your car. Here, I’m trying to shrug off a fellow NA on turn 13 of Nelson Ledges Road Course. Unfortunately, he was a bit better than me! In addition to the track time, there’s also a dyno on site for the turbo guys to put their money where their mouth is; there have been some powerhouse 951s to make it to the ‘Fest, so this is always a fun event as well. This year’s 944Fest has some great timing because Friday the 944Fest attendees have the track, but Saturday PCA has a Driver’s Education event; many PCA members attending the ‘Fest are getting more than one day of performance driving in this weekend! But for those of us outside the PCA (or those of us with shallow pockets…) can look forward to other activities on Saturday. The biggest event Saturday will probably be the car show, where track hounds and daily drivers alike are cleaned up for a review from their peers. There’s a lot of prizes available, from the coveted, “Grand Champion” trophy to the “Highest Mileage” award for the 944 present with the most miles on the clock or the “Long Distance” award, for the car and driver that covered the most distance to get to the ‘Fest. A word of caution, though; don’t expect to win the Mileage Award if your 944 has less than 400,000 miles on it – you’ve just got to trust me on that one! At the 944Fest, trophies are powder coated pistons from our beloved cars that are no longer with us. And yes, that center piston is the “That Guy” award. And yes, the gentleman with the pink racing stripes in the first picture was the proud recipient of this …unique award. The whole 944Fest crew is also encouraged to go on the group cruise on some fun old Ohio back roads to meet up for a catered lunch and some other goodies. 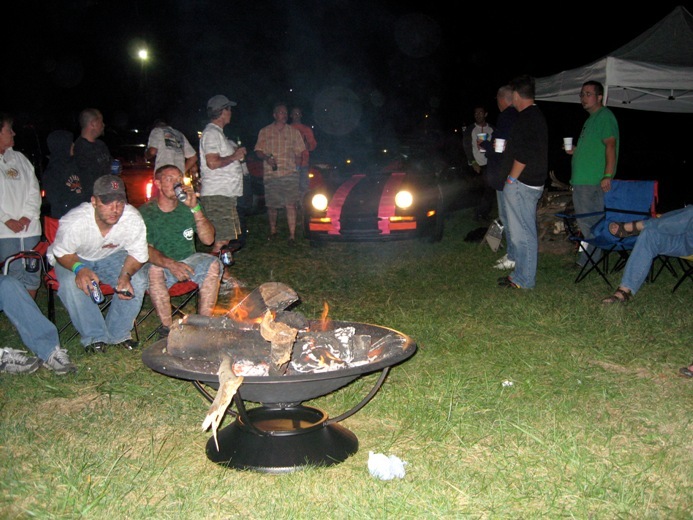 Saturday night at the 944Fest has traditionally been capped off with a couple drinks by the bonfire., though there is an infamous poker tournament that starts in the early evening, too. I’ve attended the past four 944Fests, and I have to say, if you own a 924, 944, 928 or 968, you really should consider attending. I’ve made some great friends over the past four years and learned a lot about performance driving. You can find more information about the 944Fest here. Tent – check; car wash and detailing supplies – check; bag of clothes – check; cooler with provisions – check! I’m ready for the 944Fest – are you? Again, I cannot recommend it highly enough; the weekend of June 5th will be one with friends and fast, fun four bangers (or eight, if you bring a 928..). While those who can’t make it out feel a little bad for missing a great event, never fear – I’ll post again (with ‘Fest ’09 pics!) to try and cover all the highs and lows. See you on the track! Today's post was written by frequent contributor Andrew Granieri. Andrew is graduating from Miami University in August with a degree in Technical & Scientific Communications and Entrepreneurship. He is eagerly searching for a job that will allow him to keep his performance driving hobby going. …911 owners are stunned into silence from the sheer awesomeness (that’s an industry term) of the 944Fest. It’s not that at all, John! Normally the comment boards light up a lot faster with each post, whereas here it’s just a big echo! Yeah, but that’s expected; some of the folks on there have argued with me that octane is in fact, a direct measurement of the “power” in a gasoline, not a measurement of its resistance to detonation. Ugh.